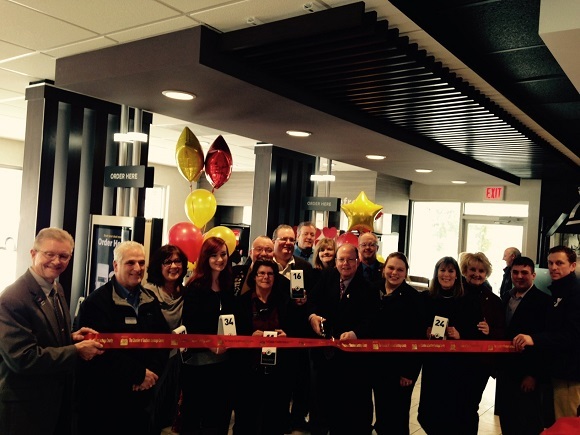 We kicked off the Grand Re-Opening of the McDonald’s off Exit 8 with a ribbon cutting. Along with the many changes was the new ordering kiosks. Stop on in and check out all the changes at the 1517 Crescent Vischer Ferry Rd Clifton Park location. Roger Grout, Owner, to give back to the local communities, gave 20% of all sales for the day split equally between CAPTAIN Community Human Services and Ronald McDonald House Charities of the Capital Region. Joining in on the celebration with Roger Grout, Owner and his staff was Kevin Tollisen, Halfmoon Town Supervisor; Paul Hotaling, Halfmoon Town councilman & Deputy Supervisor; Daphne Jordan representing both Senator Kathleen Marchione and the Town of Halfmoon; Pete Bardunias, President/CEO The Chamber of Southern Saratoga County; Tom Savino of CBRE – Albany; Sue Catroppa, Executive Director of CAPTAIN Community Human Services; Don and Lori Emery of Ronald McDonald House Charities of the Capital Region; Kathie Reeher fellow McDonald’s Owner/Operator; Richard Griesche of Catskill Hudson Bank and Chamber Ambassador; Beth Silvestri of Brookside Museum and Chamber Ambassador and Aaron Ditch of YMCA Southern Saratoga Branch and Chamber Ambassador.